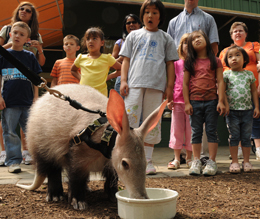 Once upon a time, there was a little aardvark whose name was Reginald. He loved his home very much. His home was under a red plastic slide at the playground, where he had lots of ants to eat. One morning, all his ants were gone! He woke up hungry, and he could not find any ants anywhere! He looked everywhere on the playground, but he still couldn't find the ants! Reginald was worried that his favorite meal, breakfast, would have to be mulch instead of ants. He tried some mulch, but he didn't like it, so he thought he would try the sand. The sand was worse than the mulch, and he spit it out in a sandy cloud. Next Reginald tried some grass, but it was even worse than sand and mulch! He spit it out into a lake! He saw some weeds floating in the lake, and he stuck his long aardvark tongue out to taste them. The weeds tasted the same as the grass, but it was a little longer than the grass. "This will not do," thought Reginald, "I must find the ants!" He went back to the playground, and he tried to bite on a basketball and the slide, but those barely even moved. He was so hungry that he was willing to try anything, but something moving on the slide got his attention. He saw a kid coming down the slide, and he ran to hide. When he hid, he found a few ants for his breakfast. As he ate those ants under the jungle gym, he realized that there were a lot of ants there, and they were eating candy! He saw the kid coming for the candy, so he ran away with the ants. "My candy must have fallen out of my pockets," the boy said. "Now there are ants in my Smarties and Kit-Kats!" Reginald was hiding behind the wired fence, and he finished off his meal there. He noticed that the ants had a deliciously sweet taste to them from the candies. It was Reginald's favorite breakfast ever.